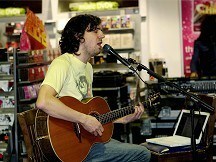 The Snow Patrol frontman and his bandmates - Jonny Quinn, Tom Simpson, Nathan Connolly and Paul Wilson - have relocated from their Glasgow base to California for the past seven months while they have been working on their upcoming sixth album Fallen Empires. "I've had some care packages from friends and family, like Barry's tea is definitely a big one for us," he told Absolute Radio's Vicki Blight, adding he also calls home each week. He added: "We've met a lot of people out here... The people that have the same accents as us definitely make us feel like we're closer to home. It's not like we've been here forever - it's gone by really fast that's for sure." The band are about to head back to British shores, but Gary admitted he would miss LA. "I've been here for maybe a year but it seems like a month. We've been making the album out here since January, and I'm just about to leave actually, so I'm going to miss the place," he said. "I wasn't really an LA guy before now, but I'd never seen the beach when I came here. When you're actually living by the beach in LA it's a whole different story, it's a whole different city."